Got caught in the volatile Market movement from the February Correction and tried catching the bottom but ended up having a big hole in your wallet? Miss the recent rebound in April due to fear from the market correction? Want to avoid such mistakes in future? Clique as it sounds but when you fail to plan, you plan to fail. This is a common trait we find in many of our clients from our years of observation. Very often they will go into a trade WITHOUT any trade plan ie ENTRY PRICE, STOP LOSS and PROFIT TARGET. Most would rush in because the stock has suddenly moved up, but when the stock suddenly comes to a grinding halt and moves down, panic sets in and doubt starts to arise. Hope starts to fill their emotion and stop loss become a NO NO to them at this point. Trading without a Trade Plan is like walking in the wildness and hoping to come out alive. Well, only a few do survive and live to tell the tale while most get crawled by the bears and bitten by the snakes and barely make it out alive. Truth be told, We also would like to find the holy grail in trading. Want the Brutal and Honest truth? There isn’t!! If anyone claims he has it, Let us know, We also want to know. Good things must share! We always hear this regret from our clients lamenting that they have spent thousands of dollars attending different courses out there, but still losing money trading the market. Many retail traders often jump from one strategy to another. When the strategy they just learnt do not make them money on their trades they give up and try something new or attend another course ploughing thousands of dollars with the hope of finding that holy grail. “We suggest traders should find a method that suits them and keep working and refining that strategy while having stop loss to manage their risks. Being complacent with a few winning trades and not wanting to cut loss because you know it all. Very often we observed that some clients will use the same lot size for all their trades without regards for their stop loss level from their entry price and they only realised the magnitude of their losses when they exited their trades. For instance, assume same trade size, a trade setup with a 10 cents stop loss, will potentially incur double the loss amount, compared to a trade setup with a 5 cents stop loss. With just a few bad trades, some could incur huge losses due to trading too large Quantity of shares per trade. “To avoid such mistake, one should first determine the amount he is prepared to risk (loss) for each trade, then determine the entry and stop loss price for the trade. With this 3 variables determined, the trader can then determine the Quantity of shares he should enter using a simple formula. Greed is often the culprit for this. When a stock goes to the target profit zone, some traders may decide to wait for a while and hope for further movement in their favour. This is where we observed greed may set in and they fail to take their profits only for the stock to reverse and start going against them. Profit to loss is probably one of the greatest stock market sin and to avoid such mistake, we may humbly suggest considering the 3 possible actions to protect your profits. Take partial profit at the first target profit area while trailing your stop loss on the balance of your position to protect the profits for your balance positions. Trail your stop loss, if you intend to hold all your position for higher potential profits. What goes up must come down and what goes down will come up? Most hold on to this saying hence averaging down on a losing long position believing it will come up one day. But if we take the case of Noble Group which used to be $17+ in its heyday and only worth around 10+ cents now after consolidation. Or even Cosco in its heyday, then we will know the risk of averaging down in a losing position. To avoid such pitfall, traders should Never add to losing positions and should cut their losses when the stock reaches their stop loss point. When a trader holds too many positions at once and the market suddenly goes against him, it may overwhelm the trader as he got many positions and do not know what to do with them. The reason is if he were to cut all his positions at once, he would incur big losses as even though each of his trade loss is a comfortable amount for him. Having too many positions at once also make the trader difficult to monitor all his positions. It is also wise not to hold too many stocks in the same sector. For example, holding all three bank stocks in your portfolio. Well, if all move up then good for you but the moment they come down you might suffer a serious setback. It is good to diversify into a few sectors in your portfolio. Hence it is important to know the maximum of positions that you are comfortable to hold when trading the markets and ensure you are aware of the total risks of the positions. “I heard…..This counter got some news ar?” We get comments and questions just like these as rumours make their way around the market. Clients often get trap chasing a stock after hearing some rumours. One secret of a successful trader is to keep records. Unlike love which keeps no record of right and wrong doings, A disciplined trader keeps track of his trades. Lastly, if you have not got any training and want to trade, well it is kind of like a layman taking on a boxing champion which we know what the results will be. You will either come out badly bruised or worst-case scenario ends up in the hospital. Likewise for trading, without proper training, the market will be brutal and will come at you and chew you up. 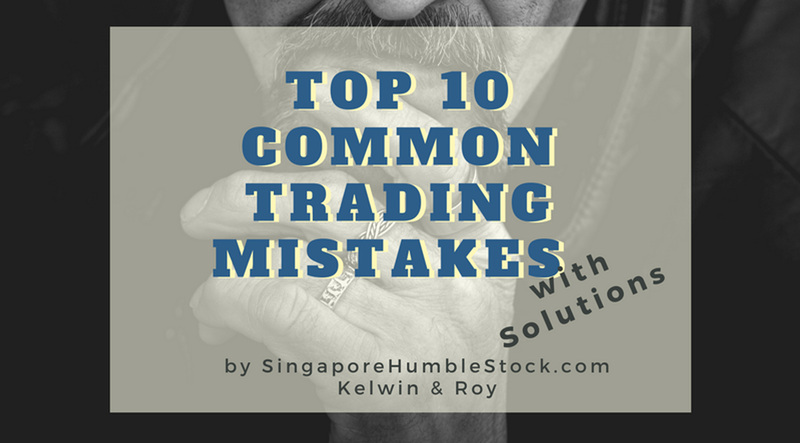 So here we have summarised the Top 10 Trading mistakes that we have observed from our clients, during our career as Top Trading Representatives. We hope these mistakes that we pointed out will help you greatly in analysing your trading areas of improvements and become a better trader! Please Feel Free to Leave your details below should you wished to know more about CFD and counters that might have great potential.